Before the horses could be returned to the range as planned, Eureka county and local ranchers, (including one rancher under a formal decision of cattle trespass), filed a legal challenge with the Interior Board of Land Appeals (IBLA) to stop the return of wild horses to the range in an assertion that the federal government has no authority to release the horses. The claim goes further in demanding more removals and even the destruction of horses in holding facilities if BLM has no space to warehouse mustangs they remove from the range. One hundred sixty-two of the 432 wild horses captured in February by the Bureau of Land Management (BLM) from the Fish Creek Herd Management Area (HMA) in Eureka, Nevada – were returned to their home on the range. Trucks and trailers rolled onto the range today and 162 wild horses run free once more. The 183 horses that had been trucked to holding facilities have cost $6335.00 per week just for holding fees alone, which now total just over $25,000.00. Five mares and one stallion died in holding and fifteen gave birth. The mares and foals will be released at a later date. Return to Freedom and Wild Horse Education were granted status to Intervene on behalf of the BLM’s management plan. The IBLA has now ruled against the County’s request to hold the wild horses in the facility until the underlying claim is decided. 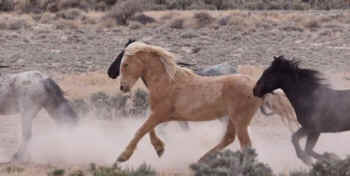 The authority of the BLM to return the wild horses has now been affirmed. Arguments in the case continue on the underlying claims. Return to Freedom, a national wild horse conservation and advocacy organization, runs a large scale sanctuary in Lompoc California. The method of fertility control proposed at Fish Creek has been used by the sanctuary for more than 15 years. The sanctuary manages 400 formerly wild horses. “We are thrilled that the Fish Creek horses, will be returned to their home range and regain their rightful freedom, this is a good day!” said Neda DeMayo President of Return to Freedom, who first visited Fish Creek in 2004. “Now is the time to move forward with innovative management that makes sense, keeping wild horses on their range and saving millions of tax dollars in the long term. It is time for a new direction, instead of wasting time and money obstructing positive solutions that will benefit the horses, wildlife, ranchers and the range”, DeMayo continued. Laura Leigh, President of Wild Horse Education (WHE) a national non- profit based in the state of Nevada, has been active in monitoring and in discussions with the BLM on the Fish Creek herd since 2012. In addition to actively engaging in the current management strategy for this herd based on recommendations from the National Academy of Sciences (NAS), WHE has been monitoring range conditions and trespass livestock in the area. Leigh witnessed the entire roundup, the horses in holding and was present at the release. Leigh has documented these particular wild horses for years including their capture and captivity. A special stallion named “Sarge” was one of the stallions released back to the range. More than 5,000 people signed a letter to use in the fight to return the Fish Creek horses and Sarge.